New Jersey Leisure guide is the largest single source of complete and impartial NJ restaurant reviews. Unlike other sources that review restaurants on the basis of a single visit by a restaurant critic, or on the basis of restaurant diners, our restaurant ratings and reviews take into account a wider audience and are the result of a compilation of many sources, including restaurant critics and diners who have eaten there. Learn more about the process we use to rate New Jersey restaurants. This restaurant opened in the summer of 2009 and while it's too early to give it a meaningful comprehensive review, from the few early reports we have received, owner/Executive Chef Steve Cozzi is off to successful start with his new fine dining Jersey shore restaurant. Chef Cozzi is a Culinary Institute Graduate having honed his chef skills at famed restaurants like Marie Nicole's in Wildwood Crest, Winfields in Millville, and some of the top restaurants in Atlantic City. Fuze is a 100 seat restaurant decorated in NYC minimalist chic with two spacious banquet rooms, a large dining room, and a bar-lounge. Steve Cozzi has assembled a team of CIA graduates to serve up traditional menu items with fresh ingredients and a creative touch. When available, the popular starters are: American Waygu Beef Tartare with winter truffles, confit of wild seasonal mushrooms, capers, egg yolk, Bermuda onion truffle vinaigrette, Crème Fraiche, and toasted brioche; and Prosciutto Di Parma “Carpaccio” with slow roasted tomato parmesan flan, nicoise olives, crispy Prosciutto, young basil, aged balsamic gelee and Arugula. When available, for dinner entrees, the popular choices are: Lamb “Wiener Schnitzel” with lemon confit caper berries, minted-soft fried egg, fingerlings and herb salad; and the Orecchiette “Mac & Cheese” with crispy spec, oven roasted tomato compote, chive, Wisconsin bechamel, herb and toasted bread crumb. Save room for dessert, they are fresh baked daily. They are open for breakfast daily from July 4th - Labor Day, and serve excellent, healthy and creative selections of French toast, omelets, egg dishes, cereals, cranolas & fresh fruits. 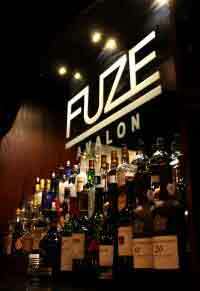 The lounge at Fuze is a good place to meet friends for a drink and on on Friday evenings during the summer months, there is often live piano music.